North Korea's state media reported Tuesday its leader Kim Jong-un has learned about "social and economic development" through his surprise overnight tour of Singapore, a day ahead of his planned summit with US President Donald Trump. On Monday night, Kim left the St. Regis Hotel, where he is staying, and visited tourist attractions in the city-state. The Korean Central News Agency confirmed his nighttime tour of Singapore, a rare quick disclosure of the leader's detailed itinerary and schedules during his overseas trip. "Kim Jong-un, chairman of the Workers' Party of Korea and chairman of the State Affairs Commission of the Democratic People's Republic of Korea, toured various places of Singapore on June 11," the KCNA said. "Going round the Great Flower Garden, one of the prides of Singapore, Sky Park located on the roof of the world-famous Marina Bay Sands building and Singapore Port, he learned about the social and economic development of the Republic of Singapore," it added. He was accompanied by his sister Kim Yo-jong and other officials, such as Kim Yong-chol, vice chairman of the Central Committee of the Workers' Party of Korea; Ri Su-yong, vice WPK chairman on international affairs; and No Kwang-chol, minister of the People's Armed Forces, it reported. The KCNA also confirmed that he was guided by Singaporean officials, including its foreign minister. 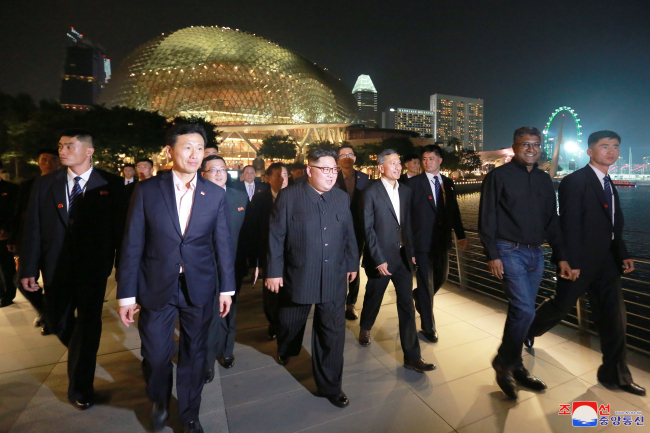 Kim enjoyed great nocturnal views, it reported, adding that its leader "is going to learn a lot from the good knowledge and experience of Singapore in various fields in the future." His tour of Singapore came a day before he is to hold a historic summit with Trump that is expected to discuss how to get rid of the North's nuclear weapons program. Kim and Trump arrived in Singapore on Sunday. On Monday, Kim was rumored to tour economic and industrial sites of Singapore, but he was not seen stepping out of the St. Regis Hotel until the night tour. The North's media continued to provide detailed coverage of its leader's trip in Singapore.